Liverpool Ladies midfielder Sophie Ingle discusses her new contract, the Merseyside derby victory and what she expects from upcoming opponents, Reading Women. 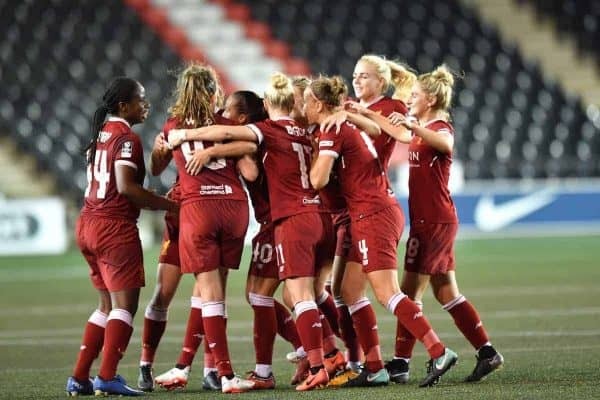 The Reds recorded an impressive 2-0 victory over Everton on the opening day of the new Women’s Super League 1 season and Ingle was delighted with her side’s performance. Niamh Charles’ second-half goal was an indication of the level at which younger players are now starting to set the bar for themselves, thinks Ingle, and she believes Liverpool deserved to come away with all three points in the derby. “In the first-half both teams had equal possession and it was quite a fair contest,” the midfielder told This Is Anfield. “We raised our game in the second-half and obviously got the goals we needed to win the game as we played it a bit more. Derbies are always quite scrappy games but we got the win we needed. “It’s massive for players like Niamh (Charles) to score goals for us,” she continued. It’s victories against the likes of Everton which make life at Liverpool so enjoyable for Ingle and she admitted she had always hoped to sign a contract extension with the club. It was delayed slightly, she revealed, but after the announcement was made last week Ingle is “delighted” to continue her career with Liverpool. “I was really excited. I wanted to sign a few months ago when the season had finished,” said Ingle. “Obviously with the internationals and the European Championships, it took a bit longer to get things down on paper. “I’m glad it’s done now so I can concentrate on the rest of the year. “I wanted to sign a new deal because I know how much we want to compete in each game. I think a lot of teams have pumped money into players but we’re not about that here. Ingle hopes Liverpool can continue their strong start to the season when they take on Reading on Friday evening in their latest league fixture. Reading lost their season opener against Sunderland after a gritty performance from the northerners and Ingle says Liverpool will need to do the same to come away with a result at the Select Security Stadium. “We have to focus on our game and how we play. They have different personnel who can play physically and also like to get the ball down and play. “We have to try and stop their main players and their main threats towards us. “They have obviously signed Fara Williams, who played here at Liverpool a few years ago. They have Jade Moore as a holding midfielder too and she likes to link up with the attack and acts as a playmaker. “We have to try and stop those two with their accurate deliveries. Liverpool and Reading kick-off at 19.00pm on Friday 29 September.